We’re delighted that Ben Templeton will be speaking at Culture Geek London in May 2018. Ben has been at the forefront of producing playful learning experiences in museums over the past decade working with world-leading organisations such as the Tate, Science Museum, V&A and the BBC. We caught up with Ben a recently about his work, his passion for the cultural sector and what to expect from him at Culture Geek. You’ve done some incredible work with the cultural sector, what excites you about working with the arts? Thanks! The passionate community are a big factor, and that there is an audience crying out for decent cultural experiences, but what really fires me up is the sheer quality and diversity of the content available. We’re on a quest to help our audience learn, which means we’re always learning too. It’s hard to go back to making christmas games for Jack Daniel’s after gorging on the Tate’s collection or watching children’s eyes light up when play-testing a Science Museum prototype. What have you been up to in 2017? It’s been a bit of a shocker on the political and environmental front, hasn’t it? I really enjoyed working with the Natural History Museum of Utah on a big game about climate change, just one small way our industry can stick it to Trump. The V&A opened their exhibition road entrance this year and Preloaded were selected to make a game about how the building has changed over the years. What a place, I love it there. My big news is that, after three years with Preloaded, I’m moving to pastures new, starting with a cracking game for Science Museum. Watch this space! You’ve been working in the sector for years, what changes have you seen in the way in which digital is being used? In some ways, not much has changed. Traditional formats and techniques are still really important; video production, in-gallery audio-visual, the constant UX dogfight that is website design. 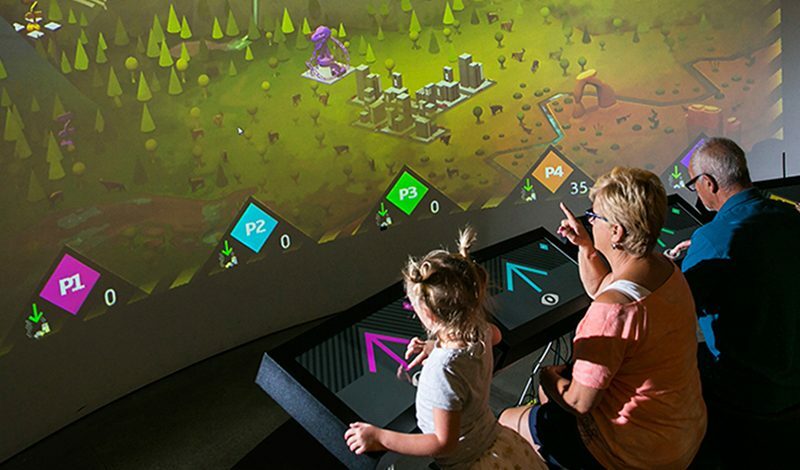 On the other hand, there’s a real swell of confidence in the way technology is being used; from subtle, immersive experiences like The Lost Palace or Bodiam Castle’s choose-your-own-adventure by Splash & Ripple to the Barnes Foundation’s well-judged use of machine learning. Some organisations are nailing it, but many are still guilty of trying to run before they can walk. It’s harder than ever to make elegant and effective digital experiences so the best ones should be celebrated all the more. What trends do you think we’ll see in 2018? I’m expecting the year of machine-learning-this, machine-learning-that, but I don’t think much will change in only a year. Momentum is certainly building around in-gallery VR, partly down to the proliferation of tech partnerships, but the industry is also getting to grips with what works and what doesn’t. As museums are moving away from releasing apps, doubling-down on responsive and HTML5 solutions, AR is the one thing that’ll draw them back. I expect to see one or two good examples but the vast majority fail to actually enhance my enjoyment of the art itself. You’re speaking at Culture Geek this year, what will you be talking about? My area of expertise is helping organisations create experiences that are playful, social, educational and get people thinking differently. Designing to change how people think and behave is actually really hard work, so Rob Cawston (Head of Digital at National Museums Scotland) and I want to unpick – from our respective sides of the divide – how to properly set the stage for commissioning great work. We’ll show examples of the best – and worst! – out there; games are the answer, but what is the question? Ben Templeton will be speaking at Culture Geek London on May 9th 2018. To find out more about the conference and book your tickets click here.